Capsule Summary: Klinger attempts to adjust to his new role as company clerk while B.J. grows increasingly upset about a letter he received from Peg. There aren’t a lot of episode that can be considered sequels to earlier episodes. “Our Finest Hour” is a followup to “The Interview” while “Lend a Hand” is a followup to “The Consultant.” But “Period of Adjustment” is more than a followup. It picks up roughly two weeks after “Good-bye Radar, Part 2.” Off the top of my head, I can think of just one other example of a direct sequel: “Change of Command” takes place immediately after the events of “Welcome to Korea” during the changeover from Colonel Blake/Trapper to Colonel Potter/B.J. at the start of Season 4. Like those two episodes, the two-part “Good-bye Radar” and “Period of Adjustment” were intended to address the departure of a character. In this case, it’s Radar. Rather than replace him, the writers decided to make Klinger the new company clerk. This episode sees him trying to fill Radar’s tiny yet also very big shoes and run the 4077th with the same efficiency. Only he can’t and everyone, with the exception of Father Mulcahy, Hawkeye, and B.J., keeps reminding him that he can’t. It’s always nice when M*A*S*H remembers characters who’ve departed. “Period of Adjustment” includes references to all of the characters who left the series other than Frank. There’s plenty of talk about Radar, of course, but also Colonel Blake and Trapper. You can’t discuss “Period of Adjustment” without addressing B.J. falling apart in Colonel Potter’s office. It starts out okay. Actually, it starts out with B.J.’s hilarious “You wore your soldier hat!” when Hawkeye walks in. But then things get serious and depressing and painful. I know there are some fans who hate this scene, who can’t stand the way B.J. sobs and growls through his pain. Others love it and think it’s a poignant display of a father’s love. There’s a line–perhaps not always a fine one–between believable emotion and melodramatic hysteria. It’s possible Mike Farrell crossed that line in this scene. It’s also possible very few watching have been in B.J.’s shoes and therefore can’t begin to understand the depths of his anguish. If the sobbing scene is too much for you, what about B.J.’s meltdown in the Swamp? I think this is a great scene that allows both B.J. and Hawkeye to vent a little bit. As it progresses, Hawkeye begins to get angry. B.J. isn’t the only one who misses home–he’s just usually the loudest about it. Hawkeye’s anger feeds into B.J.’s anger and suddenly B.J. is destroying the still and hitting Hawkeye in the face. Poor Hawkeye. 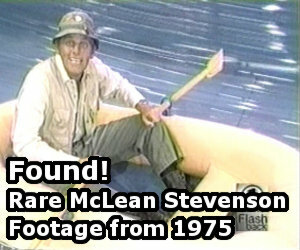 Something similiar happened in “Mail Call” (Season 2) when Trapper got drunk and knocked Hawkeye aside with his bag as he tried to go AWOL. As for Klinger, I think the best part of his story is Father Mulcahy’s talk with Colonel Potter about how long it took Radar to grow into the job of company clerk. Leave it to Father Mulcahy to be the voice of reason. It’s only fair for Colonel Potter and the entire 4077th to cut Klinger some slack and stop expecting him to be Radar. Nobody expected Colonel Potter to be Colonel Blake. As he reminds Klinger, everyone gave him the chance to make the job his own. One last thing: There’s a slight disconnect between the Klinger who managed to find a generator when Radar couldn’t in “Good-bye Radar, Part 2” and the incompetent Klinger seen in “Period of Adjustment.” But it’s only a slight disconnect. Tracking down a generator is one thing. Knowing how and where and when to file dozens of reports is something else entirely. Two weeks doesn’t seem like enough time to figure that all out. When Charles is warning Hawkeye about how drunk B.J. is (“If I were his liver, I would sue for separate maintenance”) it’s almost feels like Charles is worried about another human being. Watch his face closely: he goes from glib to concerned. Who drew the picture of Radar tacked to the dartboard for the “Vaccinate Radar” game? Klinger and B.J. were both really drunk. Also, I wonder if a member of the cast or crew took the picture home with them as a memento. This is one of multiple Season 8 episodes with “Also Starring Gary Burghoff as Radar” in the opening credits. One of my favorite episodes. I thought Mime Farrell’s acting was superb… Utter anguish brought to the surface by a night of drinking. Anyone who has drank to forget during a difficult time in thier life can probably relate. I can only imagine BJ waking up the next morning with a hangover and being completely embarrassed about how he acted last night. Jamie Farr on the other hand I think plays drunk terribly. Completley overdoes the slurring. I agree about Charles showing concern. Hawkeye:”Old news, Charles. I’ve seen BJ drink before.” Charles: “Pierce…Not like this.” Maybe not exact quotes but close. Overall I love this episode. I understand Mike Farrell has said this was his favorite episode because it allowed him to stretch his acting abilities more than he was able to previously on the show. With that said, I kind of like this episode . . . just kind of. Obviously, I wasn’t crazy about Radar’s departure, but at the same time, like RJ said, this episode managed to pull off very interesting throwbacks to both Henry and Trapper at the same time: I like the scene where Potter admits to Klinger that he felt uneasy living in Henry’s shadow when he first arrived, but people were willing to give him a chance to be who he is instead of trying to be Henry; and of course B.J. goes off on how much he hates Trapper (despite never meeting him) because he and Hawk were such good buddies, building the still together and everything, but he’s home now too. I think the producers and writers made the right decision in just promoting Klinger to Company Clerk – from what I understand, there were two other possible scenarios: one was that Rizzo was going to be Radar’s replacement, but they decided replacing Radar entirely was not a wise decision (and he later ended up replacing Zale anyway); the other was through some odd and unusual circumstances, Sidney was going to be transfered to the 4077th and placed as their new Company Clerk, but Allan Arbus didn’t want to commit to a regular role. I have always thought that BJ’s break-down in Colonel Potter’s office was one (out of many) of the most heart-wrencing scenes on the entire show. It’s a brilliant piece of acting by Mike Farrell in my humble opinion. Despite hearing the words “I’m so torn up with envy, I practically hate him’ and “I’ve been gone a lifetime – Erins lifetime,” so many times, it can still make me choke up. And I don’t even have kids yet. On a more lighter note, Klinger’s drunkenly terrified line: “Oh, God, BJ, he’s gonna beat me up!” never fails to make me smile. All in all, I really like this episode. It has some very funny one-liners and great scenes – from Charles grumbling under his breath, when he’s asked to help look for BJ and Klinger to Father Mulcahy’s way of putting things in a new persepctive. I always secretly cheer on the dear Father when he ’suckers’ Potter in his own gentle, forbearing way. If they kept the BJ angst to this episode, things would have been fine. It is an excellent show with realistic feelings and anger. But the fun didn’t stop there. In later episodes, we see BJ upset because Peg has taken a job to help with the bills, and of course, BJ beating everyone at poker and pinball will take care of the money shortfall. Or, my favorite BJ whine, Peg has to clean the gutters and we learn of the muscular handyman Carl and BJ’s two neighbors – the old man on one side and the lecherous husband on the other. By this time, it was overkill for BJ’s sob stories. Actually, on the other side of the Hunnicutt’s house, their neighbor was usually bagged. But, back to “Period of Adjustment” for a minute. BJ: If it isn’t Benjamin Franklin Pierce, “Hawkeye”, named after an Indian, a President, and a stove. I don’t get the last of the namesakes. I really thought BJ was justified in his anguish over Erin growing up and he wasn’t there to watch it happen. A very powerful episode worth watching. BJ’s later complaints would seem somewhat petty by comparison. On the other hand, BJ clearly loved his family and missed them. Finally pouring out his frustrations after pouring the bottle made for an emotional and intense scene. Of course, Klinger is typically Klinger-“Oh, god, BJ, he’s gonna beat me up!” Also, it seems it wouldn’t have been that hard for Klinger to learn how to use his scamming skills for his new job, after all who would have been company clerk when Radar wasn’t around? I’ve been in a situation where I was far away from my family and it was not within my power or control to go home. No it wasn’t the army, but the accommodations were about to same. You live for letters and the occasional phone call. There were plenty of people with kids there too. Anyway, the point is that we all missed our families and letters from home were hard, especially when there was something going on we couldn’t be there for. After day after day of not being able to go home, you kinda learn to deal with it emotionally. One thing you don’t do is behave as though you have a monopoly on grief over missing your family. That’s enough to get people really mad at you. Not only is it rude, it’s insensitive to the others around you who have their own stuff going on at home that you may not know about. My problem with BJ is he acted like he was the only one with a wife and kid at home, the only one who misses his family. His scene in Potter’s office WAS crossing the line into melodrama. I can speak to that because I had a family member die while I was away from home and couldn’t do anything about it. Yes I broke down but didn’t howl and shriek. Not because I didn’t feel like doing it, but because it could really upset someone else who may have things going on at home they also can’t control. Why should I allow my grief to hurt someone else unless I’m completely selfish? 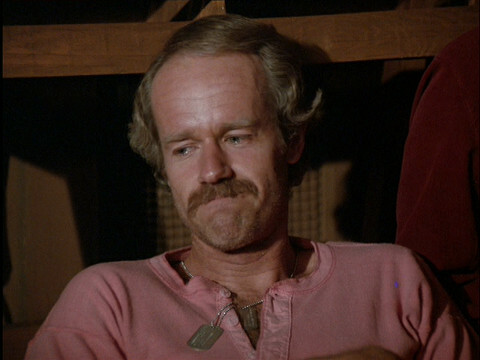 Mike Farrell seemed to be dying for an Emmy at this point and he never did get one. He had watched almost every other cast member get an award and thought it was his time. I think he may have been nominated for this season. His acting chops ring false for me. I’ve heard several actors talk about how certain actors will try to draw the viewer’s attention to themselves while someone else is speaking. Farrell always did this. In other words, if it’s a shot of the three guys in the Swamp and Charles is speaking, Farrell will shake and shake and shake the envelope to get the cookie crumbs out. When he was speaking, he shook it once which is exactly you would do realistically. When anyone else was speaking, he shook his small envelope very hard so we would notice him. I’m nitpicking too much I realize. Ever since Farrell said in an interview that he was the lead in MASH (along with Alda), it rubbed be the wrong way. There were plenty of episodes where BJ didn’t do much whereas Alan was in every one. Farrell’s ego couldn’t bring him to admit that he was a supporting actor not a lead actor. It tells you something about his emotional scenes and what’s he’s hoping to accomplish. It’s less about the work and more about the accolades. If you look at the careers of others on the show after it ended, only a couple had successful careers on stage or screen. Those few cared about the work rather than the glory. Farrell isn’t one of them.